This page contains a full walkthrough of the Main Quest Retrieve Zebion in Dragon Quest Heroes 2, including enemies, objectives, and strategy. We will be updating this as we go along. 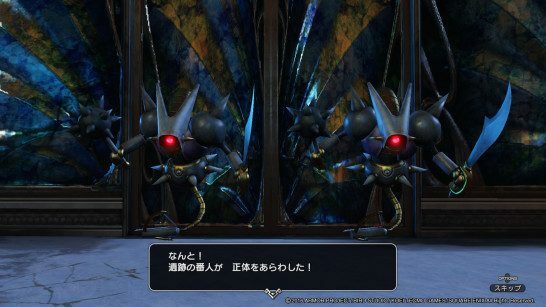 This page contains a walkthrough on the main quest “Recapture Zebion” in Dragon Quest Heroes II. Most of the terms here are based on the Japanese version of the game, so some terms may not be translated clearly. We will be updating this when the English version of the game comes out in April 25, 2017. Head to battle during the evening. From Gorda Desert, head to D-5. Report back to the camp. Challenge tora yo! Tsubasa yo! Prepare to fight against the battalion. Use AoE and monster coins to knock them down. Be wary of the monster as it will soon become enveloped in darkness. Once this happens it will gain immunity to physical attacks, thus it’s best to just flee. Make sure to heal your teammates. It is easier to flee if you can replenish the HP of the party. As the duration expires, it will enable the party to flee. There will be 2 treasure chests along the way. You will be up against two Devil machines. As a robotic-type, it is weak to Zap attribute spells. Cast the magic spell from afar to avoid any potential damage from its powerful AoE Explosion. However it still remains after causing a blast radius, thus it’s best to approach while it’s nimble, strike with a chain of melee. It has an array of techniques at its disposal such as Melee slashes, in conjunction with laser projectiles, making it a force to be reckoned with. Be sure to assign the Zap skill to whittle it down. Before the demon gun bullet E-7. Behind the room marked at G-4. Defeat all the monsters to clear this round. Stone man and Tyrantosaurus should both be lacking in firepower to make it a relatively safe encounter. Approach the middle section to find the damaged platform to encounter some Mahi-hō. These are troublesome due to both damage and explosion, thus focus on destroying it immediately. The only upside is that these do not fire quickly, and it can only aim in a linear fashion. Sneak to get close, then bring it down to seal its fate. Return for an encounter. If a monster coin is in your possession, it hits all surrounding enemies within the area. Once you take out the Mandrake marauder, this will trigger the mechanism to open the East Gate. The tactic is to keep away from the Demon Gun Bullet while cutting down the monster. Using the monster coin should make the fight relatively easier. If you clear the area, the North Gate will open. <AI = 30> As you challenge Great Rock, be sure to have some distance as the blast affects a huge radius coupled with dealing lethal damage. Using Buddhist rock monster coins is helpful to cut through the high HP mobs. Focus on whittling down the monsters HP as this will unlock the Gate. By defeating the Iru akuma no kishi, it should open the Southern path. When you come across a well, interact with it to trigger the event. It shoots fireballs and will take off in the air to flight. Missing lynx also lunges and uses Claw swipes. Majority of its attacks come from the front, thus the recommended tactic is to strike it from the side or get behind it to land some attacks. Once its HP falls to a certain amount, it unleashes powerful tornado spells that affects a wide area. This is shown by a radius on the ground, thus immediately back away to recover some HP. It is also vulnerable to spells, thus make sure to cast some Magic from a distance.